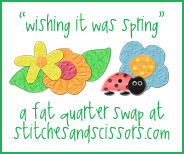 Sooooooo I finally got everyone's emails out for the Fat Quarter swap! You should have received an email from me with your swap partner. Sorry it took so long but I have been at the doctors office for 2 whole days with my daughter (seriously 5 plus hours a day). Mystery illness, lots of tests, but still no diagnosis. I will be there again on Monday so hopefully we will find out what is wrong, there is only so much crankiness and lack of sleep that I can take! lol. I have had some great success with buying fabric online, mostly on Etsy. I was nervous to buy online without having seen the fabric myself, but all is well. I mostly bought Park Slope by Erin McMorris, I think it will be my next Quilting Bee fabric. I won my first blog giveaway!!!! The Fabric Shopper is such a great site. These were the scraps that I received, I love them. Now I have to think of my next project! Lovely fabric. Which etsy shop did you use? Thanks for organising the swap. I am busy getting to know my partner a bit better. Wow...what a bright and happy post to open today. Your fabrics made me sit up and take notice...just absolultely beautiful! Got my email - thanks so much for organizing this! And finally, I'm really hoping those fabrics go to Pieced Together ;) Because they looks super fun to play with! My fav etsy shop is Fabricworm - her pictures seem to be a very accurate color representation - plus she ships from CA, so you'll get your order next day! I hope things work out for your daughter and she feels better, keep us posted. What wonderful fabric you got, I love it all and congrats on your win. thanks again for hosting the swap! i really hope the docs figure this out and she gets better SOON!!! 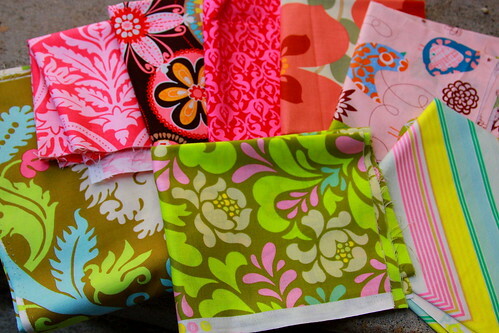 those are some great fabrics you bought & won!!! I do hope your little one is on the emnd and soon. Thank you so much for organising the swap - it's an enormous task. Sending get well wishes to your place, hope all is on the mend soon. You've done a great job with the swaps, thanks for all the organising. I hope they will soon find out what is wrong with your daughter! The fabrics are beautiful. Good luck on Monday! Hope your doughter feels better soon! The fabrics are beautiful. And yes I got the mail with my swappartner and I'm going to check out her blog now. Thanks for organizing the swap! I'm sending my FQs out tomorrow. Your new fabric looks wonderful. Thanks everyone. 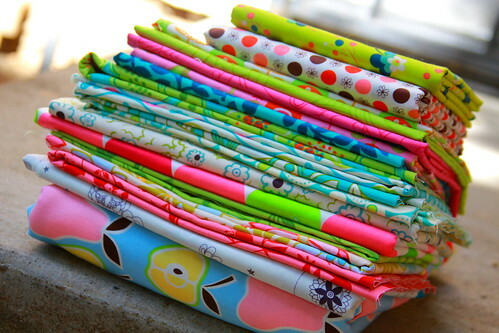 I hope that the swap is fun, I know we all love getting fabric! I love Park Slope. I almost had to buy more the other day. Good luck with the Doctor. I got my swap info the other day, and I'm getting everything packaged up! Thanks again. 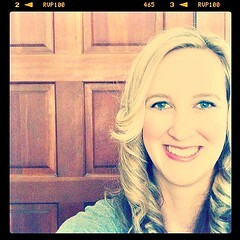 so sorry about the mystery illness...that makes it so hard on everyone. hope all is well soon. thanks so much for organizing the swap...i'm having trouble deciding what to send, but should have it bundled and ready to go by the end of the week. thanks again! Oh, I hope your daughter gets well. I sent my swap package yesterday, Thanks for hosting! How is your daughter doing? I so hope she is improving! When you get a chance can you send me the email with my swap partners information? I never received it. I just sent you an email as well ;) Thanks!